The list of molecules stored in the database (not including commercially sensitive studies) is available. The database contains the computed low energy crystal structures and their associated mechanical, spectroscopic and morphological properties found in a lattice energy minimisation crystal structure prediction search, for a range of organic molecules. The prime purpose is a tool for CPOSS to improve the methods of computational crystal structure and polymorph prediction, by allowing an assessment of how the relative energies and other properties correlate with the observed polymorphs. However, it also serves as a resource for helping characterise new polymorphs, guiding experimental searches for new polymorphs, as well as providing testbed data for new ideas as to how kinetic factors determine which thermodynamically feasible polymorphs are actually observed. The database can be accessed by the Crystal Structure Navigator interface https://www.ucl.ac.uk/cposs/ using the username and password supplied by CPOSS. This is a new location for the database, and all old usernames and passwords will no longer work. If you require a username and password, please contact Louise. The data selected using the interface can be downloaded as an Excel spreadsheet. The sets of files from which this data has been selected are stored on the UCL filestore, and so may be requested from CPOSS if additional information or input files in specific formats are required. In addition to the common name, iupac systematic name and other names, the formula and 6 letter core of the refcode allocated by the Cambridge Structural Database5 are provided. The csd refcodes gives the CSD refcodes of the known polymorphs, solvates, enantiomers etc. In cases where a crystal structure is known to CPOSS, but not yet in the CSD, a temporary refcode UCLXXX is used. In cases where no crystal structure of the computed type (unsolvated, mono-hydrate etc) is known, then the refcode NNXXXX is used. (The latter types of refcode will be updated as part of the database maintenance, but we cannot be relied upon to update all csd refcodes entries). Each conformer is given a conformer name which is dictated by the study, for example "opt" is used for the lowest energy structure found by ab initio optimisation by the method noted in D eintra theory 1. Other conformers will have their energy relative to "opt" given in D eintra 1, and where more than one method has been used to evaluate the energy penalty for changes in conformation, D eintra 2 by the secondary method D eintra theory 2 is given. There may be some conformer comment. In some cases the molecular structure taken from the experimental crystal structure (conformer name =expt) is used to determine the differences in the lattice energy landscape caused by the differences between the ab initio optimised and experimental molecular structure (apart from the systematic error in X-ray determination of hydrogen atom positions, which is corrected for by standardising the X-H bondlengths to neutron values.). In these cases, it is generally not possible to estimate D eintra meaningfully, as the ab initio energy differences are dominated by experimentally insignificant differences in bondlengths etc. In cases where the structure has been refined by DMAflex, the conformation will start "df" and will be unique to the structure. In cases where different tautomers are studied, the D eintra 1 will only relate to the differences between conformations of the same tautomer. The conformer comment will include the energy differences between the tautomers, so it is not included in the automatic calculations. Usually, each computed crystal structure (denoted by refcode_conformer name_label), in the database is a low energy minimum in the lattice energy, calculated using potential used. All unique low energy crystal structures up to a energy threshold deemed appropriate at the time of the study are included. This is usually at least 5 kJ/mol above the global minimum in the lattice energy, but may be more if the plausible energy difference between polymorphs is higher or the uncertainty in the calculated crystal energies is large. Similarly, the criterion for deciding that two structures are sufficiently different to both be included is somewhat molecule and scientist dependent. For example, when searches have been performed by using a range of conformers, differing in certain torsion angles by say 10°, then although it is probable that had a simultaneous optimisation of the conformation and crystal structure been possible, that these would have converged to the same structure, at the moment these have distinct entries. CPOSS is using the increasing experimental evidence of the plausible energy and structural differences between polymorphs, and knowledge of the computational errors, to refine these criterions for the crystal structures included in the database. In some cases, there may be crystal structure labels such as "exp3" denoting minima corresponding to experimental crystal structures (form 3) which were not found in the search (most commonly as Z’>1), and so would not otherwise be in the database. Note that these are minimised structures, using the same computational model as used in the search. Thus the entry under experimental info is generally "null" for hypothetical crystal structures, but will correspond to “form I” etc, when that structure corresponds to the lattice energy minimum found by optimising the experimental structure using the (appropriate) rigid molecular structure and potential found in the search. In cases where many quite similar conformations have been used, then a given polymorph may be found more than once in experimental info. The “exp” crystal structures are denoted in experimental info as "Form 3, not found in search". The data describing the crystal structure, space group, Z, cell density and those needed to fully define the structure (i.e. cell parameters, symmetry cards and atomic coordinates) are available to enable further calculations to be performed on these structures. However, the structural files shellx (.res) and FDAT (.dat) format are available directly from CPOSS. The intermolec lattice energy, computed by DMAREL using the potential used is made up of the electrostatic contribution plus the repulsion dispersion energy. The total lattice energy includes the adjustment for conformational changes, i.e. total lattice energy = intermolec lattice energy + D eintra theory 1. The accuracy of all these energy contributions can be improved, new terms (such as the intermolecular induction (polarisation) energy) added, and completely different methods could be used to evaluate the relative energies of the crystal structures. Hence, the provision of the information as separate components, which can be updated, or manipulated in the spreadsheet in different ways. The currently unused field data defining comp model will be used for structures generated when any fundamentally different modelling methods are used. The elastic stiffness tensor10 and k=0 phonon frequencies6 of the perfect crystal at 0 K are estimated within DMAREL from the second derivatives of the energy with respect to rigid body motions. The elastic stiffness gives all the elastic stiffness tensor Cij, in order (Cij, i=1,6) j=1,6), with the relationship of the Cartesian axes of this tensor to the crystal axes defined in elastic axis definition. There are up to 21 independent non-zero values of Cij, depending on the crystal symmetry. The lowest eigenvalue of shear submatrix of Cij, lowest eigenvalue shear , gives a measure of how susceptible the crystal is to shear forces, and the corresponding eigenvector indicates the orientation of the plane of weakest shear stiffness, with reference to the elastic constant axis set. Several other properties that can be simply estimated from the elastic tensor data11, such as the Young’s modulus of a bulk polycrystalline aggregate, are available from CPOSS. The k=0 rigid body harmonic frequencies are also calculated, and harmonic frequencies will include the low energy lattice modes observed by infrared (and teraHertz) and Raman spectroscopy, as well as inelastic neutron scattering. The symmetry assignments or spectroscopic activity of these modes is not yet included in the mode descriptions. However, the actual motions associated with each mode can be obtained from the harmonic modes entry, with each mode having the three Cartesian components of the x,y,z, translation for each molecule in the unit cell, and the rotation around the x,y,z, axis for each molecule in the unit cell, listed in that order, in order of ascending frequency. (i.e. there are 6Z components to the eigenvector for each frequency given, with the first 3Z defining the relative translations of the molecules within the unit cell, and the second 3Z the relative rotations. The list starts with the 3 modes of zero frequency which correspond to a uniform translation of the unit cell). These modes can be viewed in Rudolph12, and the appropriate input files can be more readily obtained by requesting the prop.out files from CPOSS. The molecules will only move as rigid bodies, as assumed by these calculations, when there is a significant energy gap between the lattice modes given in harmonic frequencies and the vibrations of the isolated molecule. The lattice modes or elastic constants that involve displacement of the intermolecular contacts involving flexible functional groups will be most affected by the mixing of inter and intramolecular modes (c.f. pentaerythritol ).10 Thus, for some flexible molecules with low frequency torsion or ring puckering modes etc, the second derivative properties are not included in the database as the values would be meaningless. In all cases, the likely accuracy of the estimated values must be interpreted in the context of the conformational flexibility of the molecule. As part of the search procedure, all crystal structures generated in the searches have the approximate second derivative matrix used in the minimisation examined for being a true minimum. Any structures that are found to be transition states in the lattice energy are either discarded, or reminimised in a lower space group symmetry, usually generating a Z'=2 structure. (Currently, the database only contains the results of searches in common packing types with, and thus only a few structures with Z'¹1 which have arisen from such searches or from experiment are included. Cases where a more exhaustive search procedure has been used, for example, Crystal Predictor13, will have this noted in data defining comp model. The harmonic modes and elastic constants are calculated using appropriate transformations of analytically calculated second derivatives for greater numerical accuracy. Very occasionally, when the potential energy surface is very flat, the recalculation of the harmonic modes may give a small negative frequency, or the elastic constant calculations not satisfy the Born stability criterion. In such cases, whether such crystal structures are actually stable minima is beyond the current calculations and very dependent on the energy surface used, and the born stability met entry is set to "0" as a warning that these problematic structures are currently thought unlikely to be observable. An estimate of the relative growth rates of the possible faces of each crystal structure and the resultant morphology has been made using the simple attachment energy model14;15, which is most appropriate for vapour grown crystals below the roughening temperature. The calculations uses the geometrical BDFH method (calculated by GDIS16) to identify up to 100 faces for consideration, face miller, and then MARVIN17 to calculate the surface and attachment energies, face esurfu and face eattu for these unrelaxed faces. Since this approach means that Z'>1 structures have a different growth unit from Z'=1 structures, the morphological data is not generally included for structures with Z'>1. The attachment energies and surface energies for the crystal structures are calculated using potential used (or a suitable isotropic atom-atom model if the potential used in the search is too complex for these programs) though the potential derived charges corresponding to the same wavefunction used for the DMA are used for the electrostatic contribution. The calculated attachment energy morphologies are not very sensitive to differences in the potential18 and hence this approximation, or ignoring changes in the charges with minor changes in conformation, is generally adequate within the other errors of the attachment energy model. The database lists the unique faces, face miller and the corresponding surface and attachment energies, face esurfu and face eattu in order of increasing attachment energy and diminishing morphological importance, including those faces which according to the attachment energy model calculations would not be visible. The dominant morphological face is denoted by dominant face having a value of "1", and a small value of face eattu for this face is an indicate of growth problems. The face aspect ratio as a measure of the predicted shape of the crystal has not yet been implemented, but the .gmf files available from CPOSS can be used to view the predicted growth and equilibrium morphologies in GDIS16. It is important to stress that generally only the first half-dozen or so faces in the list are likely to be visible in the growth morphology, but many more, often different, faces will be visible in the equilibrium morphology, which is why such an extensive listing is stored. A "1" entry in is polar denotes that the face is polar with a dipole moment greater than 0.05 eÅ, and hence attachment energy calculations will not give the observed distinction in growth rates from the symmetry related polar faces. More importantly, a crystal which has polar faces, in principle, has a morphology dependent surface energy contribution to its energy19 arising from the net dipole component on polar faces. Although, in practise the crystal surface dipole may well be neutralised in the growing environment, it should be noted that the database is assuming that this is the case, and the stability of polar crystals may be being overestimated relative to non-polar crystals. The growth volume entry for each crystal is its relative volume growth rate20 of the crystal, and can only be interpreted relative to those of the other computed structures for that molecule. These relative growth rate assume that the proportionality between attachment energy and growth rate is the same for different crystals of the same molecule, an is obtained by integration over the crystal volume20 and the quoted growth volumes are scaled relative to a cube in which each face has an AE of 5 kJ/mol. (The calculation of the growth volume assumes that no visible face has an attachment energy, face eattu <-100 kJ/mol, and if this is not the case, will be in error by an amount that depends on the morphological importance of this face. Please notify CPOSS if such an entry has failed to be excluded). 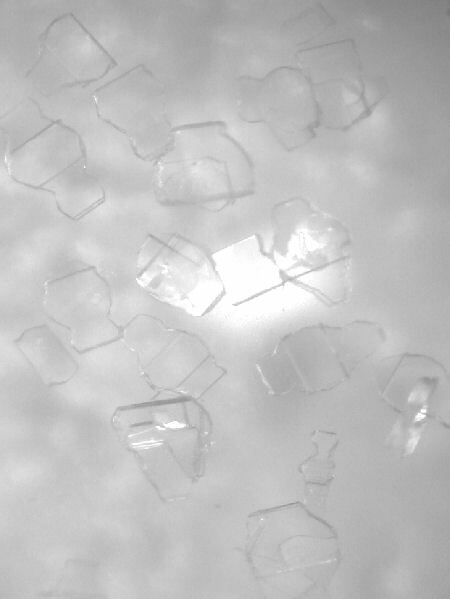 A low growth volume generally correlates with an extreme needle or plate like morphology because one or more faces have a poor attachment energy, face eattu, indicating problems in crystal growth, at least from the vapour. The X-ray powder pattern corresponding to a radiation of wavelength of 1.54056 Å, is also calculated using ObjCryst++21 for over the 2q range 5-60 ° in steps of 0.02 °, and tabulated as a string of 2q, corresponding intensity values. A .pdf picture of the resulting powder pattern, and the raw tabulated pattern (.pp) are available from CPOSS. The large entry in powder pattern can be used for a quick qualitative scan to see the peak positions as the regions where 2 values alternate with large numbers. study id number can be used within CPOSS for classification, including denoting more than one study on the same molecule. Where more than one study is stored, these cannot usually be mixed. Studies 0-9 may be used for different potentials with the same molecule, or different tautomers of the molecule with the same potential. Studies 10-19 will be DMAflex studies, where the conformation of the molecule has been optimised subsequent to the search. ordering by intermolecular lattice energy doesn’t seem to work. The database and user interface were developed under the E-Science grant "e-Science in the simulation of complex materials" with Dr Lisa Blanshard and Ms Louise Roberts at CCLRC Daresbury, under the direction of Dr Kerstin Kleese producing the database and interface, and Dr Ian Brown (UCL Computer Science) providing the tools to upload the data into the database. The data were generated by UCL members of CPOSS, funded by the Basic Technology Program of the Research Councils UK, with Dr Louise Price administering the upload and maintaining the database under the direction of Prof Sarah Price. For access to the database, or for copies of the sets of files that we have available on the dataportal, please email l.s.price@ucl.ac.uk. (1) Holden, J. R.; Du, Z. Y.; Ammon, H. L. J.Comput.Chem. 1993, 14, 422-437. (2) S.L.Price, D.J.Willock, M.Leslie, and Day, G. M. DMAREL 3.02. 2001. http://www.ucl.ac.uk/~ucca17p/dmarelmanual/dmarel.html. (3) Willock, D. J.; Price, S. L.; Leslie, M.; Catlow, C. R. A. J.Comput.Chem. 1995, 16, 628-647. (4) Stone, A. J.; Alderton, M. Mol.Phys. 1985, 56, 1047-1064. (5) Allen, F. H. Acta Crystallogr.B 2002, 58, 380-388. (6) Day, G. M.; Price, S. L.; Leslie, M. J.Phys.Chem.B 2003, 107, 10919-10933. (7) Anghel, A. T.; Day, G. M.; Price, S. L. CrystEngComm 2002, 4, 348-355. (8) Della Valle, R. G.; Venuti, E.; Brillante, A. Chem.Phys. 1995, 198, 79-89. (9) Day, G. M. Lattice dynamical studies of molecular crystals with application to polymorphism and structure prediction. 2003. University College London. (10) Day, G. M.; Price, S. L.; Leslie, M. Cryst.Growth Des. 2001, 1, 13-26. (11) Day, G. M.; Price, S. L. Properties of Crystalline Organic Molecules; In Handbook of Elastic Properties of Solids, Liquids and Gases. Volume III: Elastic Properties of Solids: Biological and Organic Materials, Earth and Marine Sciences; Levy, M., ed. Academic Pres: New York, 2001; pp 3-49. (12) Day, G. M. RUDOLPh. A program for visualising phonon modes in crystals of rigid molecules. (1.0). 2001. London. (13) Karamertzanis, P. G.; Pantelides, C. C. J.Comput.Chem. 2005, 26, 304-324. (14) Berkovitchyellin, Z. Acta Crystallogr.A 1984, 40, C100. (15) Engkvist, O.; Price, S. L.; Stone, A. J. Phys.Chem.Chem.Phys. 2000, 2, 3017-3027. (16) Fleming, S. GDIS. (0.80). 2003. Curtin University of Technology, Perth. (17) Gay, D. H.; Rohl, A. L. J.Chem.Soc.Faraday T. 1995, 91, 925-936. (18) Brunsteiner, M.; Price, S. L. Cryst.Growth Des. 2001, 1, 447-453. (19) van Eijck, B. P.; Kroon, J. J.Phys.Chem.B 1997, 101, 1096-1100. (20) Coombes, D. S.; Catlow, C. R. A.; Gale, J. D.; Rohl, A. L.; Price, S. L. Cryst.Growth Des. 2005, 5, 879-885. (21) Favre-Nicolin, V.; Cerny, R. J.Appl.Crystallogr. 2002, 35, 734-743.